We've got reusable fabric shopping bags. 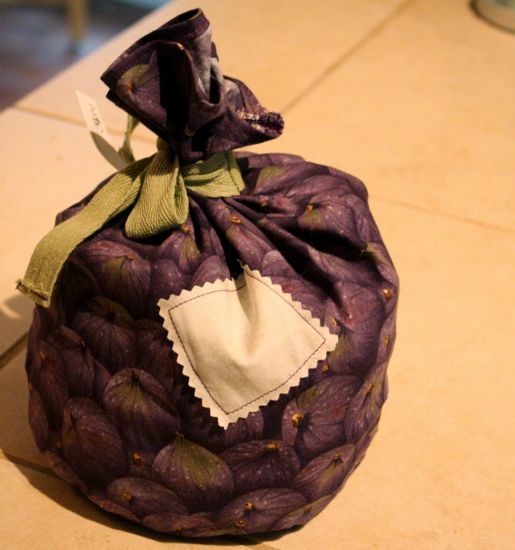 Why not have something reusable that you can use in the bulk foods aisle? I came up with this baggie a couple months ago, using fabric from the stash and π for possibly the first time since leaving school a million years ago. Since then, it's brought home walnuts, cornmeal, and granola. When it gets dusty inside, I throw it in the wash. The contrasting square is there so I can write in the bag's weight when empty, which would simplify the check-out process at the store. So far, PCC has been awesome about just taking a few ounces off the total weight, but they are probably undercharging me. I can see making a bunch of these, some wider, some taller. I can't possibly use them all, though. I wonder if other people would want them? Love this! How big is it? Could you use the blank square to write the bin code (with something erase-able)? That may have been my original idea, but I don't know what to write it with... maybe one of those air-erasable fabric markers? The latest thinking was to use a permanent marker to write in the empty weight. I use one of the twist-ties from the bulk area for the bin number label - just wrap it around the ties. I'm not sure how big this one is. I opened my compass as big as it would go and went from there. But I think a whole range of sizes has a great deal of potential. So far the major thing I can't put in there is bulk flower - it just coats the inside of the bag.